In 1966 Lockheed decided to get rid of their production reference Starfighter fuselage with c/n 2051. It was no longer needed and a bit later it fell into the hands of a very ambitious man with the name Darryl Greenamyer. He had flown Starfighters in the past and was convinced that this aircraft was capable to break any existing flight speed record. 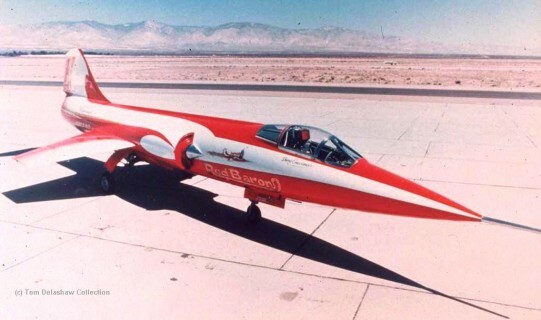 A project to build a speedrecord aircraft was born.A nose-cone came from an old F-104A. The cockpit forward section (Electronic bay) was obtained from a Lockheed used F-104A static model (M61 Vulcan-gun firing rig/platform), later discarded. The main fuselage was the former production reference framework F-104G (c/n 2051) situated at Lockheed which was used for testing equipment fit etc. In 1966 he spyed this production prototype (mockup) lying around at Lockheed. The mockup was put together with round-head rivets, so he had to drill them all out and replace them with the flush rivets! The cockpit side-panels and soms control-column bearings came from the very first produdion F-104A, which crashed in Palmdale in 1956. Some nose-wheel parts came from a scrap pile at Homestead, Florida. The idler-arm for the elevator controls, the ejection seat rails and some electrical relays came from an F-104 that crashed and burned at Edwards AFB on the edge of the Mojave Desert. The aft-section was obtained from a crashed Luke CCTW TF-104G (identity unknown), found on a scrapyard in Ontario. The Horizontal tail came from Davis Monthan AFB, Tucson scrapyard. The wings also belonged to a former Luke CCTW aircraft. This one-seat F-104G had also been written off after a crash (accident). The powerplant, on ban from the US-NAVY, was a US NAVY Phantom J79-GE10 engine which was tuned on a tested rate of 19,000 pound of thrust uninstalled. (GE-11A/GE-19 normally rated at 14,400/16,200 pounds) Greenamyer got his throttle quadrant from a Tennesse flying buff he met at the Reno National Air Races. (the Tennessean had been using it as an office decoration) The trunnion-mounts for the nose-gear, some of the cooling-system valves and a few relays on the Red Baron were no doubt the most unusual parts of any interceptor plane with front-line capability. To get those items at Eglin AFB, Greenamyer had to pay $7,500 for a 25-ton pils of junk that included ammo-cans, missile cases, several segments of a helicopter, a Continental piston engine and a refrigerator! What he got out of all this was a badly dented F-104 fuselage section that he hoped to patch up and smooth out. Greenamyer has gone as far as Puerto Rico in search of parts, and he trailered portions of the tail from Florida around 1970, while he was still casting about for a forward and central fuselage section on which to hang wings and other such necessities, Greenamyer got a hot tip from a Lockheed technical representative. A F-104 of the PR ANG had run off a strip in Savannah. After being shipped back to PuertoRico, the plane was deemed too far gone for repair. Assured that he could have the fuselage, Greenamyer packed suitable work clothes and flew from his home in Sun Valley to San Juan. When he arrivad, the guard commander was partying with friends, which lasted 3 days. To ease Greenamyer's impatience to get at the rumpled F-104, the colonel promised to have the fuselage stripped, crated and shipped to California. Two days after returning home, Greenamyer heard from the colonel. "Gee, Darryl, I gave you that fuselage", the colonel said, "but I forgot to toll the fire-marshal, and he just burned it for fire-practice". As consolation the colonel added "Don't worry, Darryl, We'll probably crack up another one, and I'll save it for you". Some of the boys at Lockheed were given Greenamyer rather sophisticated help in their spare time, and there is just a hint that the reason for their interest is a lust after vindication. There were other good solid reasons for using the F-104, one of which is the engine. It has exceptionally high compression, which enabled the airplane to set an altitude record of 103,389 feet in 1959. Another reason for Greenamyer's choice is that the airframe exists in a zero-hour, zero-defect condition, no fatigue at all anywhere. It is the kind of opportunity you don't find every day. A stock F-104 weighted 15,000 pounds empty; Greenamyer's weighted only 11,500. Armament was out and also the speed brakes, drag chute, boundary-layer-control system and the leading-edge device actuators. It received the G-model's antiskid system and brakes. Including some compensation weight inside the nose the total weight became 11,800 pound. After the record flight he planned to struck the metal of the ballast into coins by a mint to become available for collectors. However we are not sure he did. When considering these information we now have a good idea about the real identity of the F-104RB. We heard indeed the Lockheed plant used a fuselage part as a mockup to test equipment to fit. This mockup was the missing construction number 2051 which was build as central fuselage only. Those days the fuselage should have had fake-serial "FG-733" on the aft-side. The used test-rig/platform for testing the M61 could be F-104A 56-737(?) of which is known it went to Lockheed after its operational career and has never been seen since. In February 1976 it was seen at Van Nuys AB and it was made fly-worthy, still missing the engine, in spring 1976. 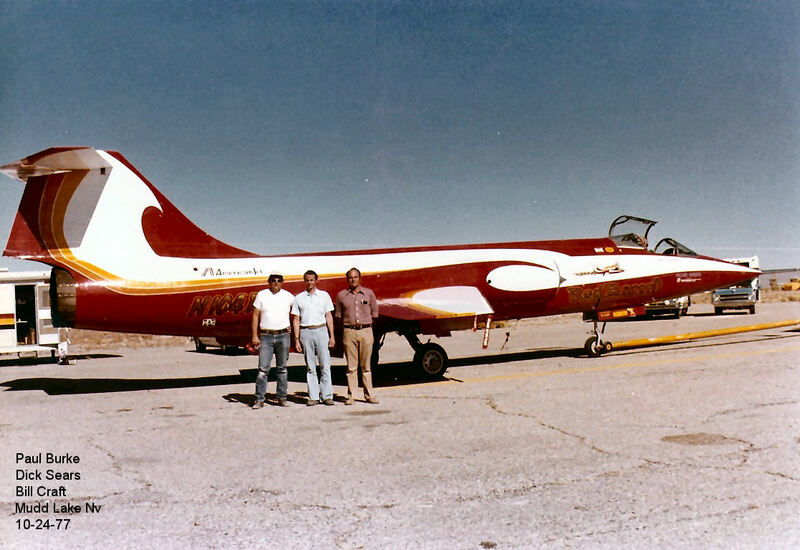 The famous red-white paint shop was given to the aircraft in May and in June it had been transported to Mojave Apt. After the engine was fitted the first test flights were made. About the F-104RB usage. It is known Darryl was a Lockheed test-pilot during the seventies and flew more then 100 Starfighters giving him a lot of experience for flying the record-attempt. 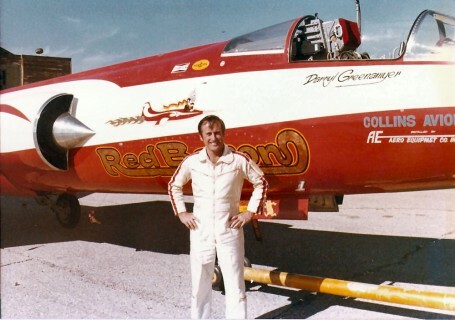 Then on 2 October 1977 Darryl Greenamyer broke the record by flying average 1010 mph. Sadly this record became unofficial due to a tracking camera malfunction.. This was very frustrating. 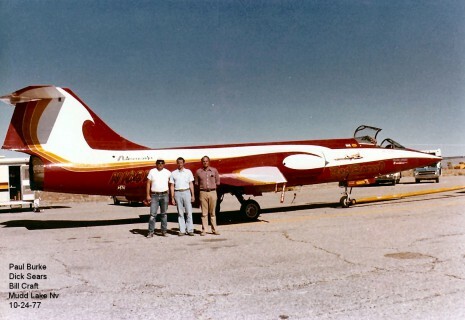 Then on the 24th that month Darryl did a new attempt and flew an FAI 3 km official record flight of 988.26 mph average. Sadly he did not break the 1000 mph this time but it was fast enough!!! After this record Darryl Greenamyer was looking out for a new challenge. He wanted to break the world altitude record. He had made some speculations about his aircraft could reach 140,000 feet and flying towards Mach 2.6 to maybe 2.8! For this reason the aircraft had to undergo some modifications. To attempt the altitude record, in his words, "I would travel at 38,000 feet at Mach 2.6 (1,550 mph). Then I would rotate upward pulling 3 Gs until I got a 12-degree angle of attack on the wing. I would hold a 12-degree AOA untiI I got a 60-degree climb angle, and I would hold 60-degree until I get back to 12-degree AOA. Then I would hold the 12-degree angle and it would lead me over the top. Increased thrust would come from a fuel additive of Greenamyer's own conception, and a water injection system at the engine inlets that, in affect, fools the machinery into thinking it is flying in cooler, more efficient air. Twenty two miles up there, losing power with very, very little thin air flowing over his control surfaces, a little too much of this or that at a wrong instant and the plane might flop over. This was the plan in February 1978. For the altitude record Darryl figured the flight would last about 15 minutes. He had deactivated some of the fuel tanks, but kept the stock extended range tanks to hold the water for the water injection-system. The J79 would use 60 gpm of water, which, at Mach 2 at 40,000 feet adds a 50 % boost in thrust by cooling the inlets to 100 degrees (Celsius), and raising the air density to the engine. On February 26th 1978 he made the fourth practice run/flight. He had made already 3 of 4 test flights in preparation for the altitude record attempt. On this 4th test-run, towards dusk, he went up from the Mojave Airport to test the power-boosting water-injection system. It worked flawlessly, being exhilarated, Greenamyer made one low, slow pass for photographs, then with 20 minutes of fuel left on the downwind leg of his approach, he lowered the landing-gear. All "greens" went on except for the left wheel. Greenamyer changed bulbs, and he raised and lowered the gear half a dozen times, but could not get a safe indication that the left wheel was locked down. While he made another 200 mph pass at 50 fest, a former crewman, Bob Flaherty, stood in the middle of the strip trying to see if the dime-size locking pin of the left wheel was in place. In the falling light he could not see the pin of either wheel. Greenamyer flew 30 miles to Edwards AFB. Because there was no time left for a chase plane to scramble up and try to spot the pin from directly from below, Greenamyer bounced the Red Baron along the Edwards strip at 200 mph to try to ascertain if the left wheel was locked. The wheel felt spongy to him; the control tower reported that it was collapsing slightly on impact. Because the heat generated by friction, if an F-104 is belly-landed, conflagration is almost a certainty. Because the wing tips are a scant 6 inches above the belly, total destruction was also very likely. With 10 min of fuel left, Greenamyer headed for the Edwards "ejection-area", 20 miles farther out in the desert. 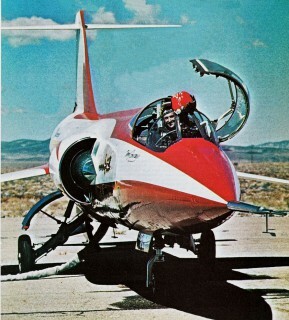 As he climbed to 10,000 feet, he remembered with irony that he had tested every component of more than 100 F-104's, but never an ejection-seat, and now he would be using one he had made himself out of scraps. With 5 minutes of fuel left, he throttled back to 200 mph, shut down the engine and pulled the ejection-ring. As he drifted down he saw his Red Baron sinking rapidly below him in straight and level flight as if it would be still manned. Five miles in front of him, the Red Baron did a 180-degrae turn, passed low to his left and out of sight behind him. A minute later the agree ? crashed into the Mojave Desert, this time beyond re-collection and repair. Addison Thompson was the Director of Operations at Edwards AFB at that time. He had met Darryl and knew of his project. Addison remembered: "On the Saturday that Darryl Greenamyer had to eject, I received a phone call from the Command Post to tell me that there was a civil F-104 over the base that couldn't get one of the main gear down and to ask me what they should recommend he do. Having flown the 104 and having seen films of some of the early arresting barrier tests I knew that any attempt to land with one or no main gear would most likely be fatal. So I told the Command Post to recommend he bailout on our bombing range southeast of the airfield.... And unfortunately that is what happened." Nice to know is the piece of text inside a magazine explaining something about the speed during the successful record flight. It says, "A colleague professor learned in the workings of the human sensory system informed him that because of the lag between eye and brain, anything he saw while traveling 900 mph, 100 feet of the ground would already be 150 feet behind him!" As Darryl recalls, "What the professor said, the affect would be, that if I headed into the ground, I would never know I had!" Nevertheless this was the end of one of the most famous Starfighters ever put together. It still holds the FAI 3 km speed record today!!!! Thanks to Steve Alex, Thom Delashaw, Paul J Burke and of course Darryl Greenamyer. For more information and photos see also our webpage about the F-104 records here.